Stakeholder engagement is an essential part of CSR management. We listen carefully to our customers, suppliers and all other stakeholders, take their feedback seriously and incorporate their input into our internal reform efforts. We also collaborate with NPOs, NGOs and other social sector organizations in planning ways to solve social issues. Our social responsibility efforts evolve in three stages: from assessing legal, regulatory and other external requirements; to mission- and responsibility-driven voluntary activities that proactively meet expectations from society; to the third stage, where we work to create shared value by solving social issues while concurrently accelerating our growth. To govern and monitor Group-wide activity in each of the three stages, we deploy our CSR management cycle. Under this system, the Head Office collects information and feedback from operating organizations on the ground to identify and provide necessary support. The Head Office and operating units also hold periodic opinion exchanges and discussion forums to improve the quality of their respective CSR activities. For the Ricoh Group, providing stakeholders with information about the Group's CSR-related vision, targets and specific activities is essential to improving its corporate activities and increasing its corporate value. In order to enhance the Ricoh Group Sustainability Report as one of the important tools to foster communication with stakeholders, we have been holding dialogue meetings with experts in the fields of CSR and integrated reporting. The results of these dialogue meetings, in which invited experts give their comments and advice and exchange opinions with Ricoh people, are reported to the management team and utilized for the improvement of the Group's management and communication activities. The dialogue meeting was the fifth held following the first meeting organized in the fiscal year ended March 31, 2013—the year in which we published Ricoh Group Sustainability Report 2012 as an integration of the following three reports: Annual Report, Sustainability Report (Corporate Social Responsibility) and Sustainability Report (Environment). In this fifth dialogue, experts shared their views on descriptions included in the Sustainability Report 2016, focusing on the overview of value creation, KPIs, negative information disclosure and governance. 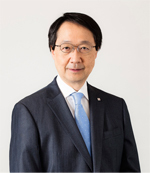 Head office of Ricoh Company, Ltd.
Mr. Eiichiro Adachi, Director, The Japan Research Institute, Ltd. The organizations and job titles are as of the date of the meeting. Ricoh's approaches to creating corporate value have been more clearly described by offering the definition of each of the different values and notes on KPIs. 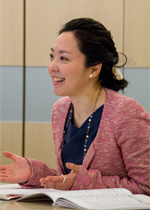 The technological strengths section is substantial, containing details on how Ricoh’s unique personnel policies, culture and philosophy support its R&D systems. My advice for improvement is that a number of actual cases involving these systems, where issues were successfully managed, could have been introduced to make the section more convincing as a whole. The Report includes an outline of the improper accounting practice identified at the Indian subsidiary. Details have been disclosed to a satisfactory, if not sufficient, degree, considering the current situation. 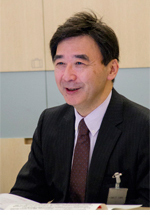 In Japan, an increasing number of similar incidents have been reported in the past few years, which indicates that many Japanese companies expanding overseas are facing governance issues involving global businesses, and experiencing particular difficulties in maintaining adequate control over group companies and suppliers outside Japan. As one of such Japanese companies, Ricoh should publicly share its appropriate and firm stance in order to fight against this industry-wide challenge that is drawing increasing attention from society. The Report could be enhanced by including more about the risks of Ricoh's operations producing negative impacts on society. It is certainly encouraging that management messages emphasize the company's commitment to solving global and local social challenges through its business activities. In addition to this, however, more discussion should be had on the theme of negative impacts. The company should communicate more openly its efforts to identify actual and possible adverse impacts its business activities have on society and take measures to reduce identified impacts. Such a sincere attitude toward negative information disclosure will be favorably received by risk-sensitive investors. Companies should be aware that such an attitude is becoming more important in order communicate convincingly with the public. It is notable that there are more descriptions of business strategies, particularly for new areas. 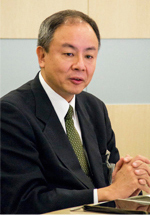 To enhance these descriptions, my suggestion is to develop them into storytelling-style articles to account for how the strategies will work to increase stakeholder value and Ricoh's future corporate value, referring to numerical targets. This could help make the section more appealing. The governance section has been substantially expanded in line with the structural reform. It is regrettable, however, that the description constitutes no more than a factual summary of established system activities. One remedy would be to include future plans, specifically for strategies to strengthen the earnings power under the new structure, or how to practice the government-advocated "proactive" governance management within the company. The section on risk management, including that on compliance, could be improved. Particularly, details of total risk management systems should be included as they have actually been implemented. Also, the list of major risks does not provide specific information sought by investors. Their key interests are in how appropriate systems have been built and implemented to prevent compliance-related and other risks from materializing and how a desirable corporate culture has been developed to ensure the effective implementation of the systems. Solid corporate systems are essential for controlling ESG risks that can reduce corporate value and, accordingly, are important for improving corporate value. The section could be rearranged to reflect the above recognition, which would help ensure effective corporate communication directed at the public. Approaches to value creation have been clearly presented, as in the 2015 Report, using images accompanied by brief written explanations. To deliver effective corporate communication, it is important to strike a balance in terms of a number of binary oppositions: between positive and negative, past, present and future, short term and long term, financial and non-financial, risk and opportunity, risk and return, and others. The overall section on value creation lacks appropriate balance in terms of risks. To remedy this, descriptions on risks should be increased, resulting in a more convincing story of the reality, which should appeal to readers more than a simple if beautiful story of ideal visions. KPI setting should be improved to reflect values that are truly essential to Ricoh. For this purpose, the company's future visions need to be clarified verbally and KPIs based on them carefully set. As a first step, calculation methods for ongoing indicators for customer satisfaction and employee satisfaction should be reviewed in view of historical backgrounds to check for consistency with goals. In the governance section, comparative charts have been presented effectively to illustrate a change in the corporate governance structure. Being appropriately simple and easy to understand, they are reader-friendly. To improve the section overall, a short summary of relevant information could have been included, such as on the background and reasons for the change (the size and formation of committees) that were subject to discussions and decisions. The report on the identified inappropriate accounting practice, included in the management interview and governance sections, provides details in a sincere fashion. For negative information disclosure, it is vital that members of the top management team communicate their messages to the public on the risks of negative impacts in order to convey their proactive stance toward integrated thinking. In the event of negative impact incidents, appropriate follow-up reporting is critically important. Given that by nature this type of reporting is made on an as-needed basis, follow-up activities can be summarized for each year to be included in annual reporting. We have worked to improve our reporting activities based on advice and suggestions provided by experts at the dialogue every year. We aim to fully achieve improvement goals, but this does not mean the end of improvement activities, as we also need to respond to the changing expectations of society. To understand relevant changes in social expectations, the annual dialogue with experts is very helpful. We deeply appreciate participating experts for offering extensive, insightful opinions and advice not only in terms of description and editorial methods but also fundamental management concepts and systems. We will utilize these opinions to improve our management practice.